If you’re thinking about buying a mid-size SUV, you should seriously consider one of the rugged and reliable SUVs that started it all, the Jeep Cherokee. You can find a great selection of these versatile and off-road capable Jeep models at Woody Folsom Jeep, serving Pine Grove, Graham, Dublin, Savannah, Jacksonville, and Brunswick, GA.
Jeep’s Cherokee has been around in similar form and function for decades, and for good reason. It’s tough to beat the versatility of a Jeep Cherokee, especially at such affordable prices! Some of the standard features you’ll find on Cherokee models include five-passenger seating with front bucket seats and rear bench seat, and an AM/FM audio system. 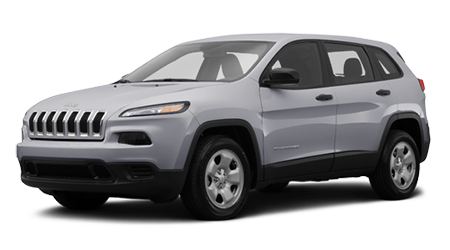 For added comfort and style, Cherokee models are available with air conditioning, leather seating and steering wheel, larger diameter wheels and tires, 4WD and four-wheel disc brakes. Jeep Cherokees are certainly known for their durable 4 and 6 cylinder engines, but if you’d like even more buying confidence, consider purchasing a Certified Pre-Owned (CPO) Cherokee at Woody Folsom Jeep. To meet Jeep’s Certified Pre-Owned requirements, a used Cherokee will have less than 75,000 original miles and be no more than five model years old. Every Jeep CPO vehicle must also pass a 125-point inspection and a CARFAX vehicle history review. Every Jeep CPO vehicle is sold with a 7-year/100,000 mile warranty, and an equivalent warranty for the powertrain. As a Jeep CPO owner you also have the option at any time during the 7-year/100,000 mile warranty period to upgrade to your choice of three genuine Mopar® Vehicle Protection Plans. The three plan options include Added Care (powertrain warranty and 650+ covered components), Added Care Plus (powertrain warranty and 800+ components), or Maximum Care (vehicle-lifetime powertrain warranty and 5000+ covered components). If you live near Pine Grove, Graham, Dublin, Savannah, Jacksonville, and Brunswick, GA and are ready to make your dream of owning a Jeep Cherokee a reality, stop into Woody Folsom Jeep. Or, you can visit the Woody Folsom Jeep website to begin the financing process by filling out our simple online finance application. Our staff of finance pros will work with Chrysler Capital and a number of banks and credit unions to get you the very best rate on your auto loan. The entire team at Woody Folsom Jeep looks forward to serving you for all of your automotive needs. We’re conveniently located at 1859 Golden Isles West, in Baxley, GA.